1. How to read your Promethease report? To read your Promethease report you will need to ensure that you are accustomed to some of the terms that are found in their report like magnitude and repute. It is difficult to sift through thousands of pages in your report. Once you organize the pages as per your unique needs it becomes a relatively easy task to. Promethease is a do-it-yourself (DIY) tool for health genetic information from 23andMe raw data. It is a third party online tool that provides consumers information about their genetic variants and how they affect your health. After 23andme FDA ban on providing health reports, people started using tools like Promethease to get more information from their DNA raw data, other than just locating distant cousins. Though Promethease is a good tool built on a repository like SNPedia there are a number of factors to consider before you decide to upload your raw data to Promethease. Promethease is popular as a low-cost offering, but it’s also very technical and disease-centric. There are many alternatives to Promethease to analyze your 23andme raw data, that are easy to follow and understand. Below we present a feature by feature comparison between Promethease and Xcode Life Sciences. 3. How did Promethease gain popularity? Promethease was one of the early companies to offer health reports based on 23andme data. When the FDA (briefly) banned 23andme from providing health reports, Promethease was the only alternative and gained popularity because of its (almost) free service. 4. How long does it take to get my Promethease reports? Promethease takes approximately 20 minutes to generate health report from your raw data. 5. What does Promethease provide? Promethease provides health report for $5 based on 23andme, Ancestry DNA, Family Tree DNA. Promethease provides the genetic risk for a number of diseases. Many users try the Promethease reports due to the cost aspect. However, there are several reports of panicked and confused Promethease users online. 6. What exactly do you get to know from a Promethease report? Promethease is a wiki-style collection of peer curated (not expert-curated) genetic information. You can search `genes/variants/diseases’ as you would in Wikipedia. A Promethease report is essentially a data dump, leaving the user to wade through a whole lot of science, statistics, charts, and graphs. This is great for people who want to geek out and want to learn about all sorts of diseases they can get!! However, if you want organized information that you can use in specific aspects of daily life such as Nutrition, Fitness, Personalized medicine, etc., to enhance your health and wellbeing, then you may not find the Promethease reports all that helpful. Promethease’ emphasis largely seems to be the variety of different diseases that one can get. 7. How do I understand my Promethease report? Please be aware that your report may cause you anxiety. Many individuals carry risk variants that will not manifest in the form of a disease. Promethease report will indicate that your risk for several diseases is several times higher than the normal population- be prepared! You will find many forums on the internet where users have shared their experience of being alarmed by their Promethease report and did further testing for that condition. 8. Will getting the health test from 23andme give me better results? 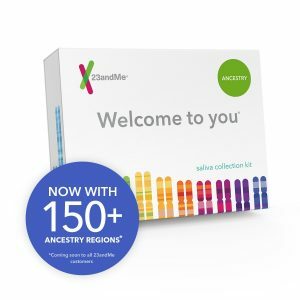 A lot of people think that getting the additional health report from 23andme will help them get better results. That is not true! 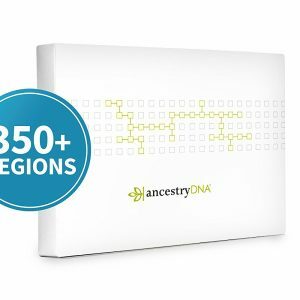 Whether you order the Health report or the Ancestry report from 23andme, the raw data you receive is the same! 9. How does Promethease work? This third party DNA raw data analysis tool, is a literature retrieval system from SNPedia which is a Wikipedia style repository where people can add information. It is not a systematic risk assessment tool. For example, for Alzheimer’s disease (AD), you will not get a summary of your risk for developing AD. Instead, you will get a list of scientific literature that is available that indicates or does not indicate your risk for AD for a specific variant. For a particular disease or trait, if there are 15 articles that report on that particular DNA location, based on your SNPs 2 information sources might indicate an increased risk, 5 might be neutral, and 3 towards the lower side. Promethease does not summarise these for you. Rather it returns all these 10 articles and makes you do the interpreting yourself. This is the major reason why many individuals are alarmed and confused by their Promethease report. 10. How accurate is Promethease? The vast majority of human traits are polygenic, meaning, several genes contribute towards that trait. Even if one carries a disease variant, they may also be carrying variants that reduce the risk of disease. Even in the case of Monogenic conditions- where one single gene leads to disease, scientist have found individuals carrying these deadly mutations but apparently healthy with no sign of disease. In a majority of the cases, the genetic risk is a small contributor towards the overall risk of that disease/condition. So, one must consider all of these things in interpreting their report. 11. Where does Promethease get all its information? Promethease only relies on SNPedia. Several other notable and high scientific authority tools are left out from the Promethease reports. 12. How do I filter through the Promethease report? It is impractical to sift through the dump of information that you get (anticipate about 48,000 rows of data). The tool is equipped with different kinds of filters aimed at assisting you. 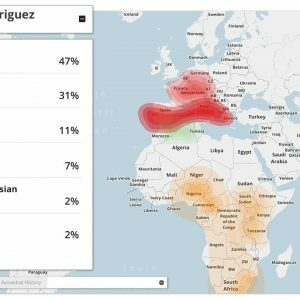 Some of them are gene names, haplogroup names, diseases, drug names (referred to as “medicines”), medical conditions, names of genes and race. 13. What is magnitude in Promethease? Magnitude is a subjective parameter that measures the interest level of the information. Here is the table partially resourced from the SNPedia website that describes what each numerical value indicates. 0 Common genotype; nothing interesting known. 14. What is Promethease repute? Good repute: The variation has a positive influence on you. Not set: There is no verified information on the nature of the variation. Bad repute: The variation has a negative influence on you. According to the SNPedia website, it is better to leave the repute as “Not Set” as all genotypes have a little of both the “good” and “bad” repute. 15. What are ClinVar diseases? This option allows you to see only the SNPs present in ClinVar. ClinVar is a freely accessible public archive of information on genetic variations specifically with clinical implications. It is maintained by the National Institute of Health (NIH). When you filter using this option you will find all the medical conditions that have been formally labeled by ClinVar. 16. How is Xcode Life different from Promethease? Xcode Life, on the other hand, includes expert-curated references not just from SNPedia but also from several large and high scientific authority databases, including UK biobank, Clinvar, OMIM, and leading scientific journals to name a few, to curate the variant annotations. 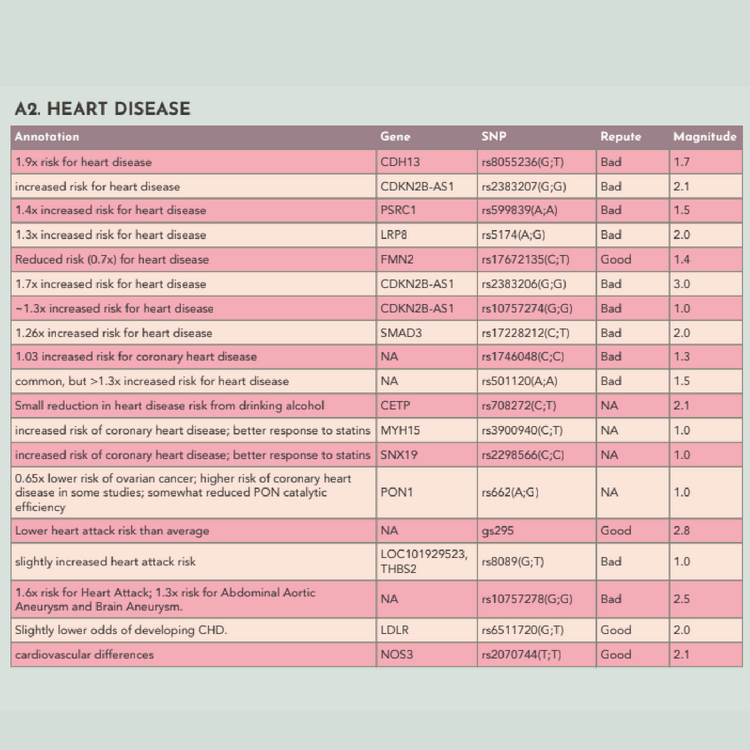 Disease risk is indicated as an average of all variants the individual carries and not a single variant. In this methodology, unless the individual truly carries a combination of several high-risk variants, their result will not be indicated as high risk. The information is then organized systematically into topical reports such as Nutrition, Health, Precision Medicine, Fertility, Fitness, Skin, Allergy, etc. 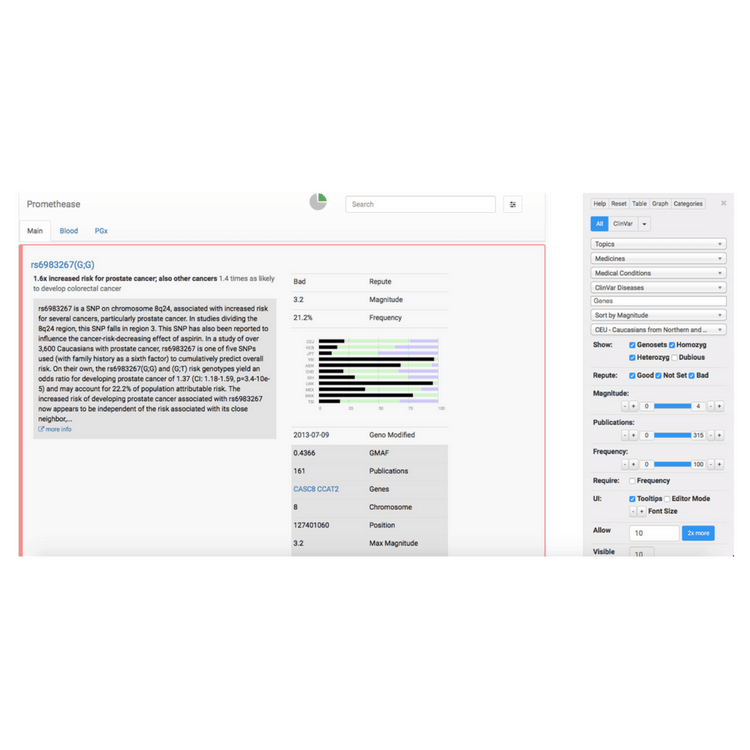 Each report is further organized into traits, which provide actionable insights into your genetic type along with specific recommendations for you. Xcode reports are easily readable, understandable and implementable. The core philosophy of Xcode reports is to empower the user with actionable genetic information that they can use to enhance health and wellbeing. As an alternative to this third party tool, many people use 23andme raw data analysis and interpretation third-party tools and services. One such provider is Xcode Life which is a global genetics and bioinformatics company which specializes in 23andme raw data analysis and interpretation using genetic raw data from all major international data providers such as 23andme, Family Tree DNA (FTDNA), AncestryDNA.com, Helix.com, Living DNA, National Geographic and others . Xcode Life provides all the information and much more, but there are key differences for you to note. These reports come with DNA raw data analysis and interpretation and specific recommendations for people with your genetic type. Counseling is also available, upon request. Xcode provides reports to individuals and professional practitioners such as physicians, surgeons, nutritionists, sports trainers, chiropractic and other professionals. These reports are focused and consumer-friendly and are designed specifically for practical use. Ease of usage of report The reports are on specific topics such as Nutrition, Allergy, skin, Fitness, health, precision medicine (drug sensitivity) and other topics. You don’t need the expertise to interpret the results as they are expert-curated. Promethease results are do-it-yourself. This means that unless you are highly knowledgeable about the intricacies of SNPs and statistics, the process of interpreting their report can be cumbersome. Recommendations The report includes specific recommendations developed by a panel of experts. Disease risk is communicated but no recommendations provided. Focus areas ➤Nutrition ➤Fitness ➤Health, ➤Precision Medicine ➤Carrier Status ➤Skincare ➤Ancestry ➤Weight Loss ➤Methylation and detox analysis ➤Allergies ➤ Breast cancer and BRCA Promethease primarily focuses on Precision medicine and disease prediction. Organization of the report The report is topical. The results are presented in a modular way. Example health, nutrition, fitness, Allergy etc. The report is not segregated based on topics. You get to know which variants you carry and the odds ratio of developing the specific disease. There you have it! With information, free is not always good and useful. A lot of users come to Xcode after having tried Promethease for $5. If you just want to satisfy your curiosity and not really looking for anything specific, then Promethease may be the way to go. But, if you want specific, organized and actionable insights from your genetic data about your health and wellbeing, then you certainly must try the Xcode Health reports!! This is perhaps the most comprehensive take on Promethease. Thanks for the article!